We’d love your help. Let us know what’s wrong with this preview of What's Love??? Books 1-3 by Niecey Roy. White picket fences and fairy tale endings aren't in Roxanna Moss's vocabulary. If she’s learned anything at all from her parents’ failed relationships, it’s to keep a lid on her emotions and the walls secure around her heart. As a PI in training by day and a writer by night, she doeksn’t have time for a relationship, anyway. 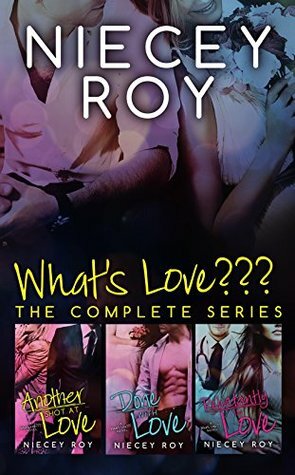 To ask other readers questions about What's Love??? Books 1-3, please sign up. From that day forward, she swore she’d never again write sappy poetry of unrequited love. Instead, a sucker for smooches an Once upon a time, there was a young girl who wrote sappy poetry about every relationship gone wrong. She had her heart broken many times before the man of her dreams stepped off a big Navy ship and swept her off her feet, promising to never hold her shoe obsession against her.